STEAM . . . it’s a hot topic in the world of educating children. But let’s face it, getting kids excited about science can be difficult. STEAM topics can get pushed to the proverbial back-burner by kids who seem to have so many other thrilling offerings to hold their interest. Enter Awesome Science Experiments for Kids, a book that includes over 100 hands-on ways to wow kids with projects that are fun and educational. Experiments include science, technology, engineering, art and math. Each project includes step-by-step instructions along with professional photographs illustrating the projects at hand. And they all offer great opportunities for fun bonding time with that special kiddo in your life. 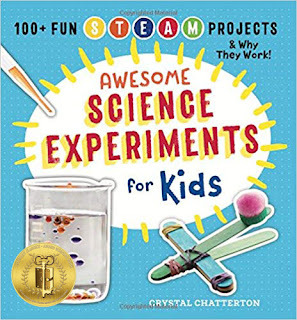 Awesome Science Experiments for Kids, is recommended for home and school libraries and has earned the Literary Classics Seal of Approval.